During the last few weeks, Texas Governor Rick Perry, who is said to be on the very brink of launching a presidential bid, has said and done some things that would have been big trouble, and perhaps mortally damaging, to most politicians. On two separate hot-button issues (gay marriage and abortion), he first identified with hard-line Tea Party “10th Amendment” interpretations that states should be responsible for sorting out such matters, only to then obsequiously flip-flop to hard-line Christian Right positions favoring the passage of a federal constitutional amendment. And in an encomium to theocracy far beyond anything Michele Bachmann has conjured, he presided over a “prayer assembly” in Houston that embraced the radical “dominionist” viewpoint that only the subjection of America to conservative evangelical prescriptions could heal the country’s economic, as well as moral, problems. Indeed, looking back over Perry’s career, these most recent examples are fairly typical of times he’s risked turning off influential factions within the Republican Party. Not that long ago, Perry flirted with the profound alienation of social conservatives by becoming the country’s most visible supporter of Rudy Giuliani’s 2008 presidential bid. 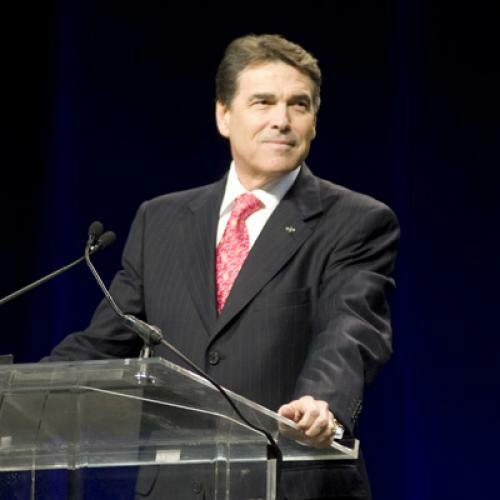 In addition, Perry has maintained his support for a law he signed as governor offering in-state college tuition to illegal immigrants brought to the U.S. as children; he’s championed a fishy-sounding and very expensive statewide transportation corridor; and he once proposed that every female teenager in Texas be required to receive vaccination for the HPV virus. So why is it virtually certain that Perry will be instantly launched into the very top tier of the 2012 presidential nominating contest the moment he announces his candidacy? To be sure, Perry has access to a lot of money, and he is renowned as a tough retail politician who loves to give conservative audiences the kind of bloody red meat rhetoric they seem to crave more than ever this year. But it’s also clear that something else is going on: In keeping with the extraordinary timing that has charmed his entire political career, Rick Perry seems to perfectly embody the Republican zeitgeist of the moment, appealing equally to the GOP’s Tea Party, Christian Right, and establishment factions while exemplifying the militant anti-Obama attitude that holds it all together. He offers the Republican Party an opportunity for unity at a time when his only rival in this respect is the underwhelming Tim Pawlenty, whose once-promising campaign could quite possibly expire this next weekend in the heat and noise of the GOP straw poll in Ames, Iowa. And unlike T-Paw, Perry has the ability to forcefully project the talking-points of various GOP factions in a way that seems authentic, no matter how often he contradicts himself. It’s a rare gift, possessed by his one-time boss George W. Bush, and even more famously by—though the comparison may seem blasphemous—Ronald Reagan himself. When it comes to wooing the far right, Perry has managed to identify himself with both the Tea Party and the Christian Right as thoroughly as Michele Bachmann, but without giving the impression, as the fiery Minnesotan often does, of being a disciple to obscure extremist thinkers, or being especially interested in pointy-headed systematic thinking. You can’t quite imagine Perry claiming, as Bachmann did recently, that he takes books by the Austrian economist Ludwig von Mises with him to browse on the beach. Nor is Perry in the habit of complicating his association with zealous evangelical pastors by excitedly telling crowds how deeply he was influenced by Francis Schaeffer. Instead, he keeps his relationships simple and at a distance, which also has the advantage of letting non-Tea Party, non-Christian Right factions in the party believe it’s all a shuck that he won’t take seriously if he’s elected. On the other side of the Republican spectrum, Perry’s most important ace-in-the-hole is his appeal to Republicans who strongly believe the GOP should avoid divisive social issues and exotic constitutional theories and run in 2012 on a straight-forward pledge to create jobs and limit federal spending. On this score, Texas’ fiscal and economic record (on the surface, at least) during Perry’s long tenure as governor makes it easy for him to claim superiority to other Republican candidates, and to Barack Obama, without advancing any messy, controversial proposals for solving the country’s economic problems. This credential represents a direct challenge to the uncharismatic Mitt Romney, whose own reputation as a potential economic savior is mainly attributable to a career in corporate consulting and to the executive abilities he displayed in what conservatives view as his less-than-ideal tenure as governor of Massachusetts. Such comparisons to other candidates help explain why Perry is already running in double-digits in recent national and state polls, without even forming an exploratory committee or spending his every weekend in Iowa, New Hampshire, and South Carolina. He’s already much more successful than Pawlenty in positioning himself as a candidate who is more electable and less controversial than likely Iowa-winner Bachmann, and more acceptable to movement conservatives than likely New Hampshire-winner Romney. And, at this late point in the process, support for Perry as a unity candidate should no longer be undermined by the longing for a dark-horse savior like Chris Christie, or an old favorite like Jeb Bush, who will come out of nowhere to save the party from its current presidential field. No wonder a lot of Republicans are willing to turn a blind eye to Rick Perry’s frequent flip-flops and over-the-top utterances, his occasional heresies to conservatism, his chronic inability to convince the citizens of his home state that they are living in an economic paradise, and his less-than-impressive intellectual credentials. Whatever he lacks on the supply-side of being an ideal GOP candidate, the demand-side of those seeking a viable conservative alternative to Bachmann and Romney will inevitably give his candidacy a big push.